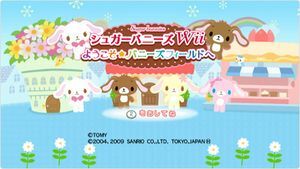 Let's make a nice restaurant together in Sugarbunnies Wii: Yōkoso Bunnies Field-e with game original cooks "Salt Usa" and "Pepper Usa"! You can experience various shops including cake shop and flower shop. The graph below charts the compatibility with Sugarbunnies Wii: Yōkoso Bunnies Field-e since Dolphin's 2.0 release, listing revisions only where a compatibility change occurred. This page was last edited on 26 January 2018, at 06:17.